Possibly engraved by C. Huyberts from a specimen by Frederik Ruysch. Anatomical diagram of a human kidney (fig. 1); a testicle that has been broken down to it's vessels (fig. 2); a condition of the hair called Plica polonica or Polish plait (fig. 3); and the head of a sheep fetus (fig. 4). 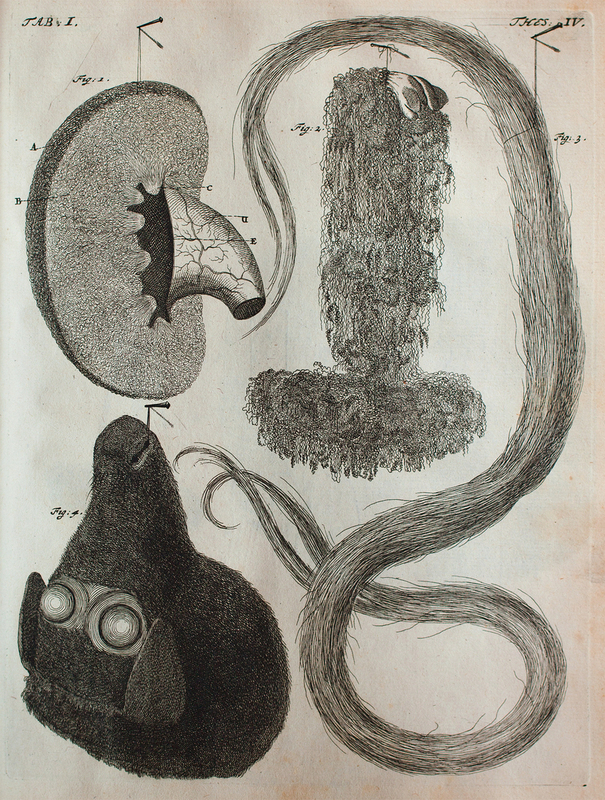 Huyberts, Cornelis and Ruysch, Frederik, 1638-1731, “Kidney, testicle, lock of hair, and fetal sheep head,” The College of Physicians of Philadelphia Digital Library, accessed April 24, 2019, https://www.cppdigitallibrary.org/items/show/1516.